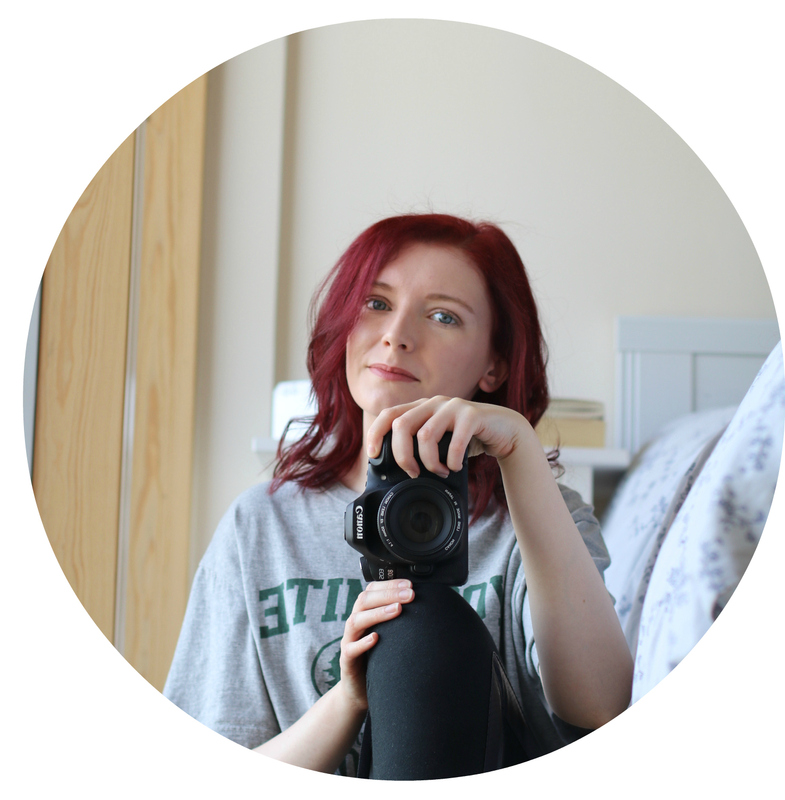 Today marks the first day of my Christmas posts! YAY! You can expect to see around 4 posts every week about everything Christmasy. You name it – food, beauty, a mini gift guide and much much more. If you’re like me and you’ve been slowly getting festive since the 1st November (the day I got my Christmas tree box out of storage…), then you are probably already in the festive mood and been writing 587 lists for who to buy gifts for, the dreaded Christmas card list – better not forget your auntie like you did last year, and the extremely important: food list. Which, of course, looks like it’s been written by a five year old because you keep adding stuff and crossing things off. By the way have you seen the price of the Quality Street tin this year? Sheesh. But enough of me blabbing on. For my first Christmas inspired post I decided to start off with a festive food post – yes it was merely an excuse to do yet another food post on pancakes, but hey, who doesn’t love pancakes? One of my favourite festive baking tradition is to make gingerbread loaf. There are a variety of recipes online, but I use the gingerbread cake recipe from April Carter’s book Decorated. If you’re on the hunt for a great baking book you should definitely check it out. I love making cake loaves as they are perfect for a quick sweet treat without the frosting. Does anyone else feel less guilty for not having frosting, or is that just me? Plus it can be a cheeky sweet treat breakfast (you work hard and are worth it! ), or for an easy grab-and-go nibble. 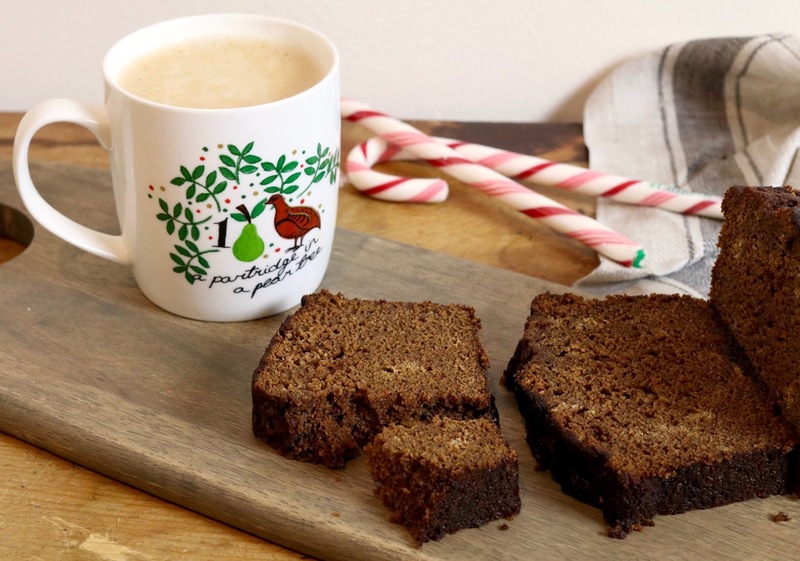 Of course any loaf cakes will work, but this gingerbread loaf is a great festive alternative. 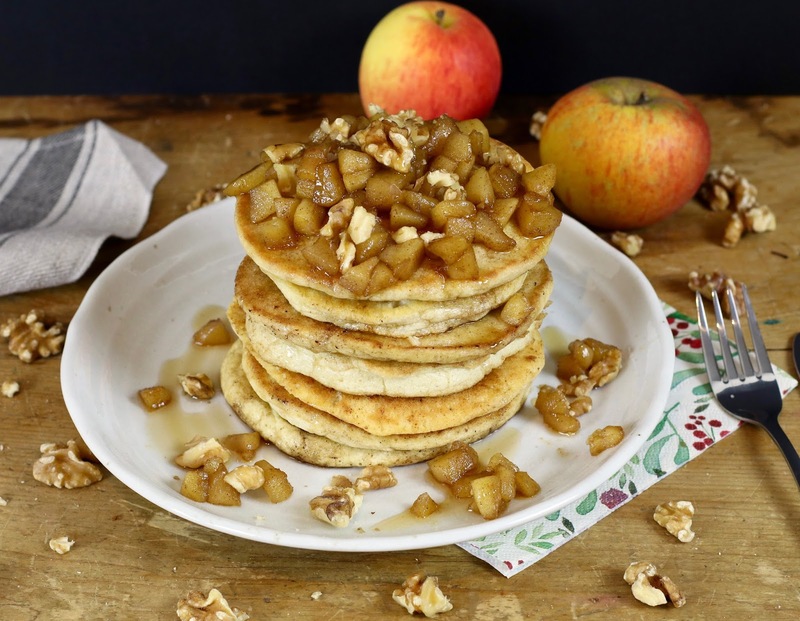 These apple pancakes can be made however you want to make them. For myself, I prefer using a trusted pancake recipe and add a seasonal spin to make the topping a little different every time. Obviously this time I’m using a delicious apple cinnamon topping that is super to easy to make. A good drizzle of maple syrup. 1. In a saucepan on a low-medium heat add the butter and apple. When butter has started to melt add the sugar and cinnamon. Stir frequently. Be careful not to overcook your apples, you want them to be softer, but still have structure. If in doubt turn the heat down to low. 2. 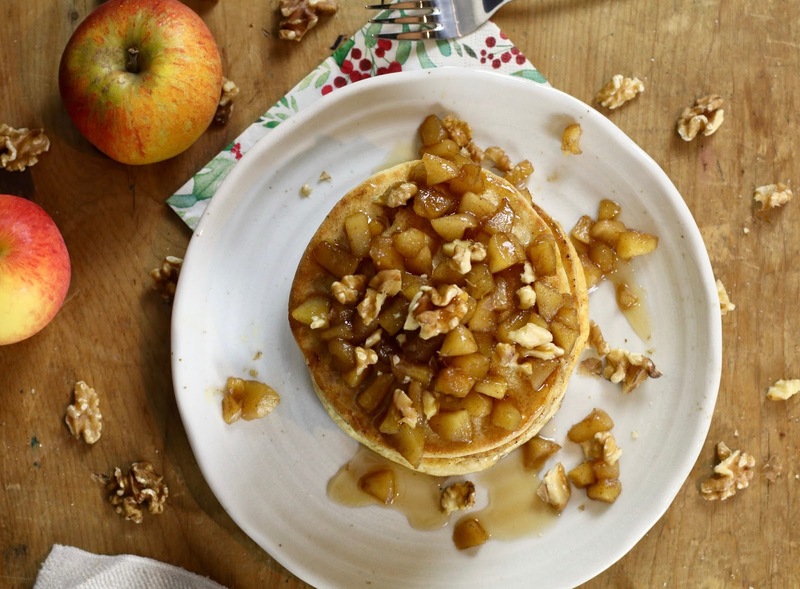 When your pancakes are nearly done add a good drizzle of maple syrup to you apples and stir. You can add as much maple syrup as you like depending on your preferences. If you want to add walnuts I would add them now, or save them as a garnish if you prefer. 3. 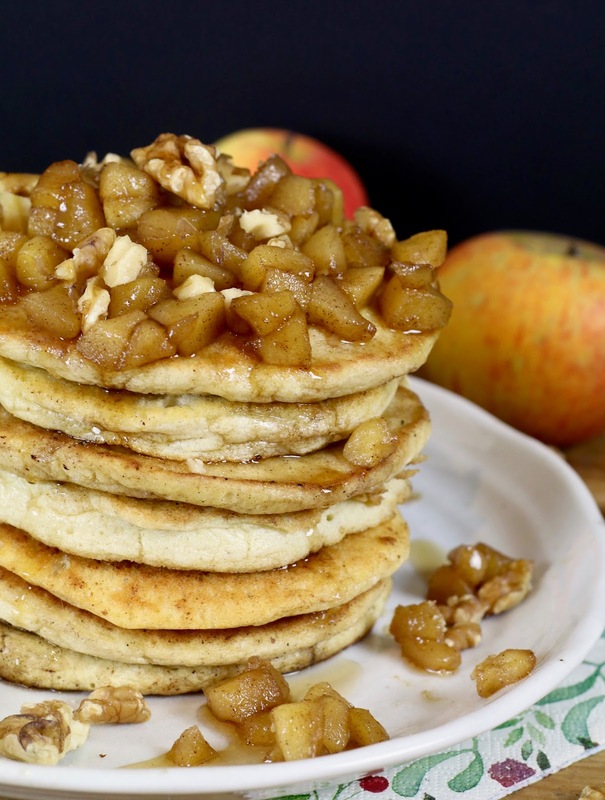 When your pancakes and apple topping is cooked how you like, simply spoon the topping on top of the pancakes, or put it into a serving dish for people to help themselves. What’s your favourite breakfast during this season? These are some great ideas. We usually have a full English for breakfast Christmas morning, which is really the only time of year we do so. Some great alternatives here. That’s a lovely tradition though. It always amazes me how many different traditions people have on / around Christmas.